Here the oxygen anions are red, titanium is blue, the partial lanthanum occupancy is indicated with the mixed grey/green and lithium is grey. While the structure is shown with two distinct layers of A-sites, in reality there is some disorder and mixing of Li and La between each layer. The Lithium lanthanum titanates, Li3xLa2/3-xTiO3 (LLT), are a series of compounds which are themselves part of a subset of perovskites known as A-site deficient perovskites. Originally discovered by Brous et al. in 1953, members of this perovskite series were originally studied for their potential dielectric properties arising from displacements of the Ti4+ cation. [1,2] However, there was not a lot of success in this area due to another physical property which lead to the discovery of LLT’s most impressive and significant application as a solid state electrolyte. 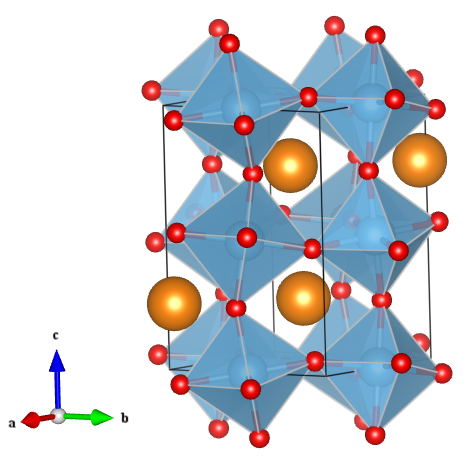 It was mentioned in an earlier post that the perovskite structure consists of a large A-site cation inside a cage created by BX6 octahdra where the B-cation is smaller than the A-site and X is an anion. In LLT, lithium and lanthanum both occupy the A-site, the B cation is Ti and X is oxygen. However, unlike standard perovskites, not every A-site is occupied for most compositions in the Li3xLa2/3-xTiO3 series, resulting in vacancies. In addition, the lithium does not actually sit in the centre of the A-site, but rather slightly off-set towards the oxygen window between A-sites. These unique structural aspects are what give rise to the extremely fast lithium ion conductivity exhibited by these materials. In fact, the specific composition Li0.34La0.51TiO3 has the highest lithium ion conductivity compared to all other solid ion conductors at room temperature. Impressively, the lithium ion conductivity comes close to even that of liquid electrolytes currently used in lithium ion batteries (1.53 x 10-3 S cm-1 for LLT compared to 1 x 10-2 S cm-1 for LiPF6 dissolved in dimethylcarbonate and ethylene carbonate). Incidentally, the high ion conductivity is what makes LLT a poor dielectric material. While the basic LLT structure is well known, there are many contradicting reports to the exact structure. It has been determined through a combination of variable temperature neutron, synchrotron and electron diffraction that the structure, and resulting physical properties, are dependent on the exact composition and thermal history of the compound. The most commonly reported structure – the layered tetragonal defect perovskite structure is provided below for Li0.3La0.567TiO3. One of the most common and versatile structure types, perovskites, cannot be considered without first paying homage to the original perovskite, calcium titanate. First discovered in the Ural Mountains of Russia by Gustav Rose in 1839, the mineral was named after the mineralogist Count Lev Aleksevich von Perovski. Starting from a face centered array of anions, the perovskite structure can be derived by replacing one pair of adjacent anions (labelled as X) in the unit cell by a similarly sized cation, referred to as the A-site cation. Smaller B-site cations can then be placed in interstitial sites such that they are surrounded by six anions. This results in the formula ABX3, which is the generic formula for a perovskite. A visual representation of this transition is shown below where the A-site cation is indicated in orange, the B-site in blue and the anions are red. Due to the high versatility of the perovskite structure, virtually every element in the periodic table can be incorporated into a perovskite structure, resulting in a vast array of properties and applications. For calcium titanate specifically, calcium is the large A-site cation, titanium the smaller B-site cation and oxygen the anion, giving the formula CaTiO3 (also shown in the figure). 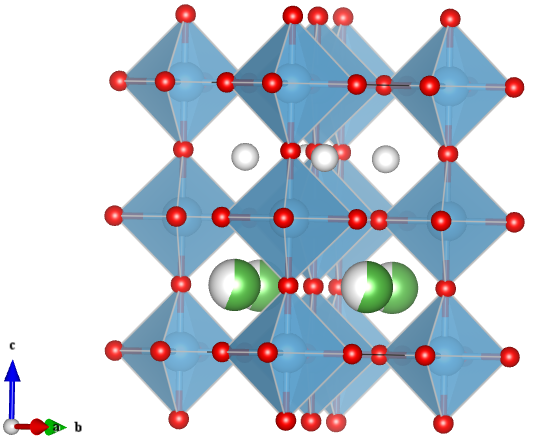 CaTiO3 is arguably one of the less interesting perovskite structures, compared to its more exotic cousins. Nonetheless, one of CaTiO3’s main uses is as one of the major components in Synroc, a synthetic rock form designed for the immobilization of radioactive waste, due to the ability to host for the nuclear fission product strontium. While on-going advances in both crystal growth and diffraction techniques have enabled more accurate measurements of the CaTiO3crystal structure, it largely has not changed from the distorted orthorhombic perovskite structure determined by Kay & Bailey in 1957.